Hc Verma i Solutions for Class 11 Science Physics Chapter 6 Friction are provided here with simple step-by-step explanations. These solutions for Friction are extremely popular among class 11 Science students for Physics Friction Solutions come handy for quickly completing your homework and preparing for exams. All questions and answers from the Hc Verma i Book of class 11 Science Physics Chapter 6 are provided here for you for free. You will also love the ad-free experience on Meritnation’s Hc Verma i Solutions. All Hc Verma i Solutions for class 11 Science Physics are prepared by experts and are 100% accurate. Thus, we can say that both the cars have same minimum stopping distance. A boy of mass M is applying a horizontal force to slide a box of mass M' on a rough horizontal surface. 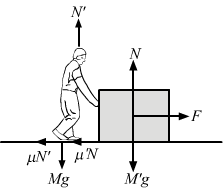 The coefficient of friction between the shoes of the boy and the floor is μ and that between the box and the floor is μ'. In which of the following cases it is certainly not possible to slide the box? Let T be the force applied on an object of mass M.
(d) > 500 N for time ∆t1 and ∆t3 and 500 N for ∆t2. d) >500 N for time ∆t1 and ∆t3 and 500 N for ∆t2. 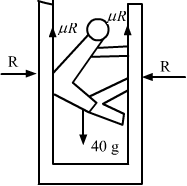 During the time interval ∆t2, the scooter is moving with a constant velocity, which implies that the force exerted by the seat on the man is 500 N (for balancing the weight of the man). 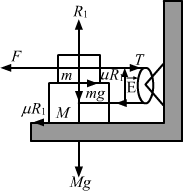 During the time interval ∆t1 and ∆t3, the scooter is moving with constant acceleration and deceleration, which implies that a frictional force is also applied. Therefore, the net force exerted by the seat on the man should be >500 N.
Hence, the coefficient of the kinetic friction between the block and the plane is 0.4. Let the deceleration be 'a'. Therefore, the block will travel 50 m before coming to rest. Therefore, the coefficient of kinetic friction between the block and the surface is 0.11. Therefore, the block will move 10 m.
Because F = 6.41 N, the body will move down the incline with acceleration, hence the force required is zero. 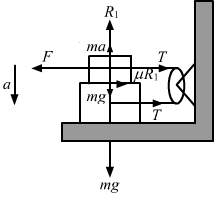 Therefore, while pushing the block to move up on the incline, the required force is 17.5 N.
For the first half metre, u = 0, s = 0.5 m and t = 0.5 s.
For the next half metre, u = 2 m/s, a = 4 m/s2 and s = 0.5. Therefore, the time taken to cover the next half metre is 0.21 s.
Let the maximum angle of incline be θ. Therefore, the maximum incline of the road, θ = 16°. The friction coefficient between an athelete's shoes and the ground is 0.90. Suppose a superman wears these shoes and races for 50 m. There is no upper limit on his capacity of running at high speeds. (a) Find the minimum time that he will have to take in completing the 50 m starting from rest. (b) Suppose he takes exactly this minimum time to complete the 50 m, what minimum time will he take to stop? Suppose the maximum acceleration required is 'a'. A care is going at a speed of 21.6 km/hr when it encounters at 12.8 m long slope of angle 30° (figure 6−E5). The friction coefficient between the road and the tyre is 1/23. Show that no matter how hard the driver applies the brakes, the car will reach the bottom with a speed greater than 36 km/hr. Take g = 10 m/s2. Therefore, the harder the driver applies the brakes, the lower will be the velocity of the car when it reaches the ground, i.e. at 36 km/h. Therefore, if the car's acceleration is less than 10 m/s2, it will take more than 10 s to cross the bridge. So, one cannot drive through the bridge in less than 10 s.
(b) In this case, the 4 kg block will move at a higher acceleration because the coefficient of friction is less than that of the 2 kg block. Therefore, the two blocks will move separately. 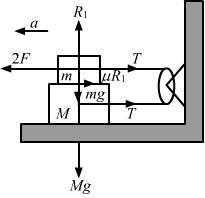 By drawing the free body diagram of 2 kg mass, it can be shown that a = 2.4 m/s2. The applied force P should be minimum, when μ sin θ + cos θ is maximum. 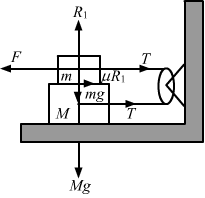 Therefore, the minimum force required is μ mg1+μ2 at an angle θ = tan−1 μ. Therefore, the maximum force exerted by the man is μM+mg1+μ. But for the 3 kg block (Fig. 3), the frictional force from the 2 kg block, i.e, 4 N, becomes the driving force and the maximum frictional force between the 3 kg and 7 kg blocks. 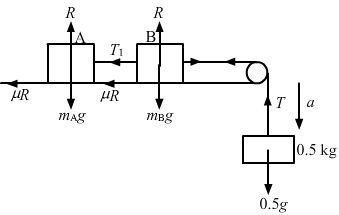 (b) When the 10 N force is applied to the 3 kg block, it experiences maximum frictional force of (15 + 4) N, i.e., 19 N, from the 2 kg block and the 7 kg block. (c) Similarly, it can be proved that when the 10 N force is applied to the 7 kg block, all three blocks move together with the same acceleration. Thus, both the blocks move with same acceleration a1 but in opposite directions. Therefore, the block will move at 53° angle with the 15 N force. During this time, mass m covers vt+12a1t2 and sm=vt+12a2t2.